Hey guys, the grass season is finally upon us and earlier today the draw for the Gerry Weber Open came out. Roger has played this tournament 13 times now but it's the first time he'll be featuring in it as an ATP 500 event. The upgrade means no first round bye for the Swiss and he'll likely be taking to the court on Monday or Tuesday for his opening match. My guess is Monday as it says “match of the day” after the opening ceremony in the schedule so it could be a similar affair to Basel. Halle has always managed to field a strong lineup of players and there are no major changes in the entries list now there are 500 ranking points at stake; Federer, Berdych, Monfils and Kohlschreiber have all made plenty of appearances over the years so the draw was always going to be tricky and Roger's half is certainly the tougher of the two. First up is Kohlschreiber who is not an easy opponent by any means and he made the final here in 2008 (l. to Federer). His H2H record is terrible against Fed but he's played a couple of grass court matches already in Stuttgart which does give him a little bit of an advantage. I watched his match vs. Monfils though and he wasn't in great form so if Roger plays at a decent level he should get the job done. The second round is a much easier proposition though with only Gublis or Stakhovsky standing in the way. Gulbis has been in shocking form this year and Stakhovsky, although dangerous, withdrew from his last match with a back injury again in Stuttgart so he's a bit of an unknown. Either way Fed should handle both guys with ease. Into the quarters and Tomic is the likely opponent although you can't rule out one of the Germans (Mayer or Struff) coming through there. Tomic plays pretty well on grass and gave Nadal a run for his money at the Mercedes Cup on Friday but I don't think he plays offensively enough to really trouble Fed. The semis is then seeded to be against Mr Consistent of 2015 Tomas Berdych, he has the big win at SW19 against Roger but the last couple of meetings between the two have been rather one sided. Berdych usually plays good on grass though so it could be an interesting one if they meet. Roger is the favourite but on this surface anything can happen. As for the final, it's the number 2 seed Kei Nishikori who is the projected final opponent. Nishikori can play well on all surfaces with his game and looking at his section there aren't many tough opponents. Monfils is the only one that stands out and he'll be heading over to Halle right about now having lost to Nadal in the Stuttgart semi finals. Finally just a quick mention of another product I was sent to demo last month called 2UNDR. It's a new line of men's underwear designed especially for sports. I got sent a pair from the Gear Shift line (pictured above) which has been designed with tennis players in mind and they're really good. Reading all that guff actually put me off the product prior to testing them but once I wore them on court I quickly changed my mind as it's a great product. I usually just play in cotton/lycra mix boxer shorts but they're not always the most comfortable especially on a warm day; the 2UNDR's on the other hand are exceptionally comfy, the fabric has a really good feel to it and you hardly realise you're wearing them which is probably the best thing about them. That's all there is too them really – nice fabric that feels good against the skin, a nice fit on the legs, comfortable and they don't get all sweaty after 2 hours on court. Basically everything you'd want from a boxer short when you're playing sport. Any improvements? Well there doesn't appear to be any light colours which is a bit of a flaw in my opinion – if you play tennis in white shorts then wearing dark underwear underneath is a big no no for me. The same goes for cricket too which is another market they are targeting so they should expand the range of colours on sale. That aside they definitely come recommended from me. If you're male, play a lot of sport and are looking for something comfortable to wear then 2UNDR's are definitely worth considering. They're not the cheapest at £24.99 but I don't think that's unreasonable as you're paying that for most standard branded boxer shorts which are nowhere near as comfy for sports. Anyway let's hope Uncle Toni buys Nadal a pair for Wimbledon 😉 and you can check out the range over at 2UNDR.eu if you're interested. Second title for Muserer. First on the grass. I cannot oppose Jonathan in his thinking of this. Sounds so very reasonable and I hope it goes like that. Actually, he lost the 2012 Halle Final to Tommy Haas. In other years after 2006, he won Halle so many times but failed to win Wimbledon (2007, 2009 he withdrew from Halle then won Wimbledon). I will cheer for him until the final, then I don’t know who I should support. I REALLY want him to win Wimbledon, I don’t mind he finishes runner-up in Halle. Such a tricky draw as a punishment for failing to triumph a somewhat decent draw in Roland Garros, but I am looking forward to a potential rematch with Stakhovsky! Cool video, just shared it! When can we expect 2004? Currently I probably won’t be able to make one every week. Maybe. I’ll see how busy my schedule is. I’ve got a few weeks of holiday coming up though at the end of June, so I can definitely upload consistently in that period. Thanks, Conal. Hope you have some more free time soon! A series of the best points each year?! Great concept, Conal. Look forward to the next one and more. That’s so cool! Every one of the opponents in the clip is retired. Oh, it’s 12 years ago. Great stuff Conal! Thank you! Thank you, Conal, I an pretty sure that I”ve watched many of those clips many times before. Still, it brings a smile on my face and gives me a lot of happiness, when I watch them every time, terrific stuff 🙂 . Yeah wish I’d gone actually. One of the best tournaments around I think. Still remember your “fan post” from Halle, it was really good. Was it the first? I know. Quite upsetting, actually. I think she meant here’s to Roger’s 8th title in Halle and Wimbledon respectively! Looks like a tough draw to me. But as we know, that doesn’t mean much. Will we be seeing the purple and pink again? Hey, where is Nadal? I thought he signed a contract to play Halle. Nadal is playing Queens this year. Yeah Nadal is playing Queens, must be getting a hefty appearance fee as his reason for playing Halle was UK taxes which take 50% of winnings and a % of global endorsement earnings for every day the athlete trains or competes in the UK. Not sure how Wimbledon operates or whether they have exemption. London 2012 did for instance. As many have pointed out on here, reasonably tough draw, but what happened the last time he had an easy one? I agree with everyone, draws are made on paper, and whatever the state of play, Roger should be the best grass player of them all. I think we go in hoping for the win, and partially expecting it, but of course upsets are basically par for the course and we wouldn’t be surprised if one happened. Totes man, let’s face it, Nobody beats Philip Kohlschreiber 9 times in a row. That is one heck of a draw. I guess a great workout before Wimbledon. Meanwhile, is the “Grand Vermin” plotting a Wimbledon title run? Hmmm? Only seen highlights but if Nadal had run into some more competent opposition he’d have struggled I think. Baggy and Tomic both won sets but then faded. I do not like this long break between RG and Wimbledon. I’ve said this before, it has taken the degree of difficulty out of winning at Wimbledon. What fun is it if you’re given all the time to adapt? Your skills are truly tested when you switch to a completely different, and relatively difficult surface. I don’t think it hinders Fed’s chances though of doing well. He’s getting the extra practise in too which if anything should help him; in fact it might see him widen the gap between himself and some of his peers because he plays so well on the surface. Trouble is, other players are getting even more practice, so I’m not sure who benefits most. I can’t get my head round there being extra tournaments between FO and Queen’s/Halle. And Novak still not playing a pre-Wimby tournament? Well, we’ll see how that pans out, I guess. Wimbledon plays so slow in the second week anyway I doubt it even makes a different these days. I see Nadal will be playing Troicki in the final. Great! Two doping brothers, going at it together. So, just like that, the guy wins a grass title? Really? but honestly, I saw two matches (Semi and Final), he was steady not superb. Did enough to win, solid on serve and he capitalized on the unforced error from both players. The picture of Nishikori on the new ATP web site looks like he should be on Zoolander. Zoolander 2 is coming out soon, maybe he will be in it! I think they were filming in Paris actually which is why Stiller was there watching. They always seem to ruin a good thing. Money, money, money. Gee, Jonathan…with those boxers, you should be in Zoolander 2. I just updated the post with a quick mention of some boxer shorts I got sent to review. Check it out and let me know what you think. What other underwear options are there for a guy? Boxers or trunks only for me. Haha! Can’t believe no one mentioned the boxer short pic! Was quite expecting to see you in them Jonathan! Anyway, tough draw but hoping Fed quick out of the blocks. Can’t afford to come out sluggish at all….. Fingers crossed for a great grass court season! Can see Kneedull winning Stuttgart but fading early in London as the oppo hots up. Troicki?? I mean Plse. Would rather watch Giorgio v Bencic! I added them in long after publishing originally. Forgot that I hadn’t mentioned them when I said I would. Heavy-duty draw for sure. Now it’s a 500 event with more top players in it but Fed usually plays better when he gets tough one. I expect Kei to be the other side of the net against him in the end. Can’t wait to see the Goat eating up the grass! I’m still getting my graphic designer to touch up the picture. I use the same guy as Justin Bieber and Beckham for their Calvin Klein campaigns. Was expecting a tough route seeing as it’s a 500. Quite a few good matchups for the whole week if Fed makes it there- especially that Tomic match. After the past few years, I don’t believe Halle is incredibly influential or indicative to what happens at Wimbledon for Roger. Many people here already whispering that this is Fed’s last chance at a slam and maybe Roger probably feels the same way so I do hope that this grass season can produce the results. Let’s kick some grASS! Elsewhere, impressive from Nadal- made his first final in what 3 years? And he’s back at Queens too? Surprising. Is getting out of the French early going to be what allows him to get back on the grass? Yeah could build some confidence with a title win but no top 10 players in sight so whether it does much for him remains to be seen. BTW, who is taking bets that Fedal happens in 4th Round at SW19? I’ll give top price 4/6. 0% chance they meet in the fourth round, despite Nadal potentially being outside the top 8. The draw will have to be massively rigged for that to happen. Quarter Final? Likely. I don’t think they will rig the draw, well we have seen it in RG. I think it will be good for the tournament if they meet early, it will be blockbuster. but yeah, I doubt it will happen, maybe quarter. Good draw to be honest, need some tricky matches in grass to get him going. Hope he will be able to defend his title, lets go Rog!!! Are you back from Paris? Kohlscheiber’s game has always been suited to grass for the same reason it is for Federer; one-handed backhand, good serve, variety and slice. Unfortunately, the talented German has 0-8 record against Federer and has only taken a set off him once. Along the fact, that he is pretty much inferior to Federer in nearly all departments makes this as a relatively easy matchup. He has to redline throughout the match to have any chance of making this close. Normally, Gulbis is a tough opponent for Federer evidenced in their matches in the pass. But he has had a terrible 2015 so far and the fact it’s played on grass. Federer’s slice and variety will cause hell to Gulbis especially on the FH side which Federer can easily expose. If Gulbis has yet another bad day, this looks like a blowout for Federer. If Stakhovsky is played out, I don’t expect he’ll repeat his 2013 efforts and Federer will have field day with his neutralisation of his serve from the slice to set up a passing shot at the net. Tomic has improved this year which is good to see. His game is particularly suited to grass so he won’t be an easy opponent. However, Federer is pretty bad matchup for him. I saw the Nadal-Tomic in Stuttgart live and his movement especially the FH on the run is a big weakness for him. I’m sure Federer will notice this and his variety will prove too much for Tomic in countering his big baseline game when he tries to impose it. However, Tomic’s big serve will make this a slightly tougher encounter than Federer’s earlier projected opponents. Berdych has always troubled Federer in the past since 2010 and we have another opponent that can be dangerous on grass for. This year however, Federer has beaten him handily in both of their encounters in 2 different surfaces. I would always be wary of Berdych’s power-hitting game being able to expose Federer’s declined movement across the baseline where the latter being taken out of the initiative and unable to aborb/redirect the pace. However, 2015, Berdych’s movement looks helpless vertically and grass is the surface that will pay the price of this weakness the most. However, I’m still not underestimating Berdych here as he is due to have a hot day again against Federer. If Nishikori makes the final, I don’t really see him as a threat since his game doesn’t translate entirely on grass. Given that Federer has beaten him last year relatively comfortably, his finesse will be more than enough to beat the Samurai. Monfils however, can be dangerous with his big serve and forehand but I doubt he will reach this far given he openly admits his dislike on playing on this surface. I also saw his match live against Nadal and he got exposed badly for being overly passive by standing behind the baseline. Overall, this looks like a tough draw for Federer on paper but I actually appreciate that. Giving tough opponents that could excel on grass is absolutely the right way to go towards his preparations for Wimbledon. So he’s giving himself a good opportunity to peak at the right time as well as getting good match practice out there on grass. Yeah I don’t see Clownfils in the final either, not after Stuttgart loss. Rather surprising that Monfools has gone for Halle as well if he’s not that keen on grass. He looked pretty disinterested against Nadal. Tried a few trick (i.e. stupid) shots which didn’t work of course. Baghdatis really had a chance for a win, up a break (and almost 2) in the 1st when Nadal played very poorly, then choked it all away. Ironically, to me Nadal’s looked better here than he has the whole clay season. But then no one to really challenge him; Queens will be a better indicator of where he’s at. Shouldn’t think Halle wanted him back anyway, in 2012 he lost in QFs to Kohli, withdrew in 2013, and in 2014 in 1st round against Brown. They got their fingers burnt same as Basel. Yeah Fed stayed very loyal to Halle over the years. All because they gave him a Wildcard when Queens Club refused 😆 big mistake. Monfils is pretty whack on grass, plays too deep. Is this a Joke? Jonathan. Was it 2002 or 2003 then? Nah it’s not true 😀 I saw it on Twitter earlier but it’s just a made up story by someone or lost in translation. Maybe the reason Fed plays Halle is because he got bagelled by Byron Black at Queens on his first appearance there in 1999. 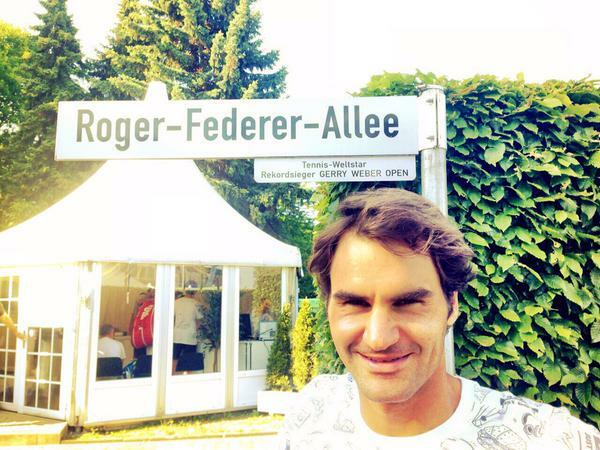 Year after he went to Halle, won a couple of matches and played it ever since. Better memories from Germany for sure and maybe he just didn’t like Queens Club that much. I’ve read that you’ve been to the US Open last year. Do you mean a camera bag or camera backpack? However a camera backpack will not be allowed as it’s a backpack and that’s on the list of prohibited items. I meant a camera backpack. Too bad that the rules are so strict, I don’t understand. I’ve never seen a restriction like that in any other tennis tournament. So I have the choices to not take my camera/lenses and so no photo, or to buy a single strap camera bag.. The new ATP website…..nice. More information at once. Yeah I think it’s pretty good. Best security. But their OS is pretty poor compared to Android IMO. I loved my old blackberry. I still have it with me. Such a wonderful phone (and this is the simple Curve I’m talking about). No frills, professional interface, fast and sturdy. Hated the switch to my first touch phone (One Plus One) a few months back (besides the camera). ATP site is frustrating. Won’t show today’s schedule…just Tues. Is it me or problems with the site? Watching this match is painful. Error after error. I can not remember seeing a slipper match. 1st serve only reason Fed is still in this. Meant sloppirer. But either will do. PK loses match and wins total points by one. What a roller coaster. Really thought Phillip played the better of the two. Any one see the only kind of tweener Federer hadn’t hit up until this match? And with that, he completes the trio. Boom! !